Bill Whittle on modern progressivism. Worth a watch. Some of my more left-leaning friends have derided Whittle for his occasionally snarky tone and “beady eyes”. Yes, he does say a few snarky things in this piece, and I wish he’d moderate them a bit so as not to drive his intelligent opposition into not listening. As far as the “beady eyes” thing goes… that sort of thing has always seemed like an insubstantial reason to refuse to listen to someone. I’d encourage a watch. It’s worth the 15 minutes. The New Black Panther case was the simplest and most obvious violation of federal law I saw in my Justice Department career. Because of the corrupt nature of the dismissal, statements falsely characterizing the case and, most of all, indefensible orders for the career attorneys not to comply with lawful subpoenas investigating the dismissal, this month I resigned my position as a Department of Justice (DOJ) attorney…Attorneys who brought the case are under subpoena to testify, but the department ordered us to ignore the subpoena, lawlessly placing us in an unacceptable legal limbo. Read the whole article here. This disturbs me quite a bit. 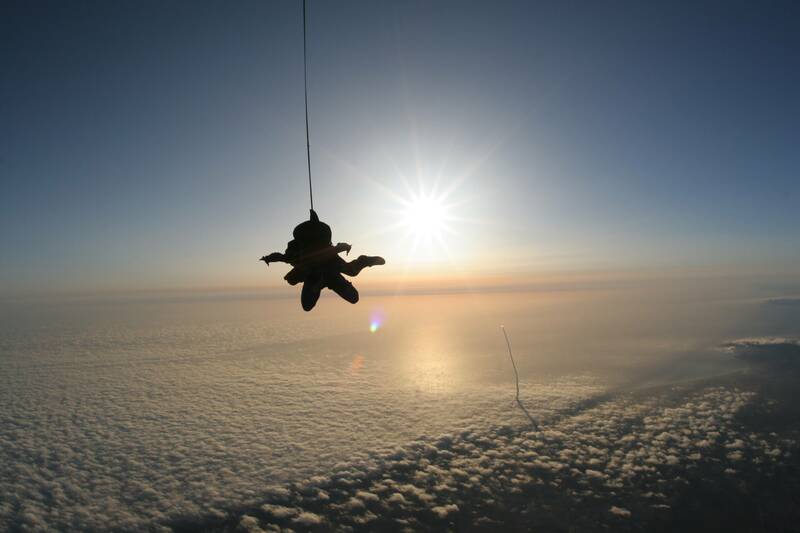 Space Shuttle launch, as seen from a skydiver’s perspective. UPDATE: Josh points out that this is sunSET, and therefore the west coast (good eye, Josh), plus that the Cape would never launch with that low of a cloud deck. It turns out that this isn’t an STS launch, but a rocket launch out of Vandenburg AFB on the west coast. Good eye, Josh! Still, cool picture. I just discovered SoundWorks– a cool website from the production teams behind the sound of many Summer blockbusters. Some really neat stuff there from the unsung half of the movies. I’m a builder. I love making things. All kinds things: furniture, props, models, small and large- if it can be built, there’s a good chance I want to build it. And if I can make it truly from scratch then sign me up. There’s just something about the act of taking a pile of raw materials and turning it into a finished, professional-looking product that provides me with a sense of deep satisfaction. Several years ago I became intrigued with the process of casting. Making a part, then creating a mold from special material and then using that mold to make copies of the original part out of plaster, plastic, or even metal, is something that seems like magic to me. So out of this came my desire to make my own mold. Here’s the story from a few Christmases ago if you’re interested. Anyway, I built another small structure (two actually) recently and decided that they needed to be populated. So I went down to our local game store (the excellent Dragon’s Lair) and bought some miniature figures. Since I was building the Inn I decided it needed to have a bartender and a couple of bar wenches, plus a small dwarf customer. I also picked up some paints and some very (very!) small paint brushes. Luckily, Hobby Lobby was having a 50% off sale on their high quality paint brushes so I was able to get some really good ones for a decent price. I hooked up the magnifiers and got to work. These mini figures are all of about 2″ tall, and the detail can be intense on some of them, so it takes a really steady hand, great brushes, and several tries to get the paint just right. In the end, though, I was happy to see that my inexperienced hands were able to do a fairly decent job. I’ve never been the best at color coordination, but I’m pretty happy with the pallet I chose. Here are some pics that Sean took with his nice new camera. They show the figurines, the Dragon’s Inn, and some internal furniture. The figs are cast from lead and tin and the Inn and furnishings are cast from dental stone- one brick at a time. Then everything is painted by hand. I’m pretty pleased with the results. Top down view of the inside of the Inn. All pieces are hand-cast and painted/drybrushed with several different coats of paint. Bar wench #2. Yes, she has pupils. Yes, they’re really small (about 1/10th of a millimeter). I had to get paint on a single strand of hair from my smallest brush and hold VERY still. Took a couple tries to get it right. Gront! He’s about 1.5″ tall. I’m particularly happy with the way his black front armor is weathered to look worn. Shingle Detail. The roof is covered with 4 different colors of paint with the last two coats being a drybrush detail coat. Better view of the roof color detail. I’m really happy with the way it turned out. Thanks to Sean for the pictures, and for hosting a great gaming day last weekend. Don’t miss his great flickr feed. The guy is pretty good with a camera. Just got hooked up with a Google Voice number (essentially a lifetime permanent phone number). Pretty cool! Today is the first day you can sign up without an invite. Check it out. It’s free, and all you need is a (free) Gmail account. Work at full price, or work for free. Never work cheap. Thoughts on the freelancer lifestyle. I try to adhere to this, and have been more or less successful. I’ve passed up some jobs that I wanted because they underpaid, and I’ve done a few things for free that ended up leading to better things. Overall, I’d rather be paid my full rate because then I tend to produce my best work. Working for cheap generally leads to feelings to being taken advantage of and general ickiness. Working free can be nice, of course, but free don’t pay the bills. The irony is that my normal “day rate” is very, very reasonable… low enough so that I’m affordable (especially in light of the equipment I’ve invested in), and high enough that I can pay my bills. People who balk at my rate immediately send the signal of “I’m an amateur and you don’t want to work for me anyway.” They’re usually correct. Hey Sean, getting any ideas? Sure, make fun of Southerners all ya want, Yankees. But when the economy tanks and chips are down, people show where they’d really like to live. Comments Off on Those Stupid Southerners? Uh oh, what about Trebuchets? Bad news: Sean’s homeowner policy won’t cover hovercraft any more. Okay, here’s a techie idea I’ve been thinking about. Now that we’re seeing GPS’s pretty much everywhere, and GPS data is incorporated into everything nowadays (google maps, photos, etc), why not a GPS equipped… cruise control? One of the little issues with my new Tacoma is that the cruise (any cruise, really) is totally ignorant of road conditions and hill angle. All it sees is that my speed is dropping and so it firewalls the throttle to try and keep it at the speed I set. If the cruise control was smarter about the upcoming road- how steep the hill is and how far it is until the top- then it could more efficiently goose the throttle to save gas. Sure, I’d lose a couple MPH on the way to the top, but I would be happy to give that up in return for not indiscriminately dumping gas into the engine while the stupid cruise control tries to keep me at 70. So why not provide some sort of look-ahead GPS altitude information to an automotive cruise control so that the cruise knows that you’re about to hit a short hill and can vary its behavior to take that into account? It seems like this is a good marriage between car tech and computer tech and I’m curious if some enterprising car company will give it a try.